This summer has been the hottest on record, but those over the age of fifty should take particular care when the mercury rises. Here’s how. This article is produced in partnership with Besins Healthcare as an educational service. Surviving an Australian summer is no small feat with even the most active and healthy of us struggling to find the balance between soaking up the heat and retreating to the energy zapping air con. Who among us hasn’t slept with a bedroom rearranged so that fans face you at different angles and wet towels cooling down the remaining inches of skin? But it’s not just about staying cool in summer, it’s also about staying healthy. Women’s health for the over-50s, in particular, requires careful navigation during summertime. A humid Australian summer means increased sweating and swelling which in turn means a loss of bodily fluids, causing dehydration. It also builds up heat in the body, causing stress, headaches, and dizziness. In women over fifty facing menopause, the added stress placed on our bodies becomes not just physical but mental. Here ae five important tips for women over the age of fifty when navigating extreme heat. With urinary frequency already shifting during a period where a woman is navigating HRT during menopause, the need to constantly stay hydrated can be an almost frustrating experience. However, staying hydrated is crucial, and as such the need to establish good water habits is a critical part of surviving summer. Making sure you drink as much water as your body needs (without going to the extreme), as well as keeping a bladder diary can help you understand how your body is responding to the heat and thirst. Try avoiding sugary or alcoholic drinks: water is by far the most effective thirst quencher. Just make sure to limit the amount you drink just before bed to minimise any possible leakage accidents during the night. Whether you are taking hormonal replacement therapy (HRT), heart pills like beta blockers or even antihistamines, be aware of how medicines and heat may impact your body’s own thermoregulation. For many over fifty, the link between menopausal hot flashes and thermoregulation are clear, but less so on how the heat may impact on your medicine intake needs. Try to have access to fans and air conditioning but if you can’t, just make sure your living conditions are conducive to rest and staying hydrated. Equally important is ensuring that loved ones know what medications you are taking, especially during extremely hot weather, so that any reactions or side effects can be quickly identified and managed. Often menopausal women will mistake an extremely hot day for menopausal hot flashes and vice versa, and with around three out of four women suffering hot flashes, it can be hard to decipher. Understanding better how hot flashes can be recognized can mitigate this. Hot flashes occur abruptly and equally disappear spontaneously, often lasting between a few seconds to several minutes. The hot flashes generally occur around the face, neck and chest and can occasionally be accompanied by sweating, redness, and palpitations. Heat-related illnesses can range from the devastating, like heat stroke, to less dangerous symptoms such as heat cramps. 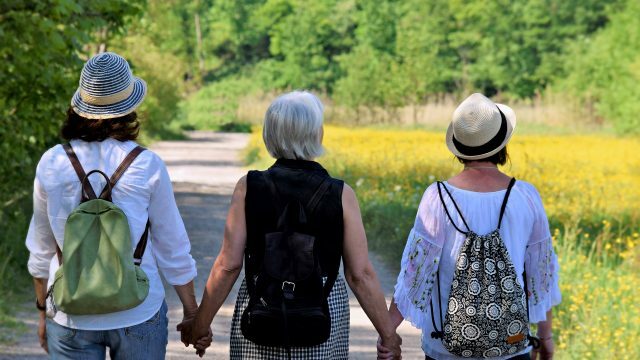 For women over fifty, it is important to reduce some of the symptoms associated with ageing, and to boost both your mental and physical wellbeing with regular exercise. Yet these adverse reactions make it near impossible to remain active during the extremely hot Australian summer. It is therefore important to focus on indoor workouts where there is less exposure to humidity as well as ensuring you are hydrated. It is also a great time to actively use your heart monitor to make sure that you are exercising safely. With menopause impacting the loss of elasticity and vascularity as well as thinning of skin, it is important during a hot summer to take note of any changes, including pigmentary changes. While our skin can wrinkle due to both smoking and sun exposure, estrogen deficiency affects our skin’s dryness and skin disorders can start to present. Taking a defensive approach during the summer period to identify sunburn, rashes and even skin infections are important when facing extreme heat and high humidity. With the heat directly exasperating some of the symptoms of hormonal changes for women over fifty, it makes sense to pay careful attention to your body’s thermostat and symptoms that may feel heightened due to the weather. While the internet is flush with advice on how to navigate this season, it is important to seek medical advice, such as from a menopause specialist or GP, to discuss symptoms and changes you take note of during a hot summer. For those over fifty, summer need not be a time to hibernate in the air con and retreat from outdoor life, but rather a time to enjoy being social and maintaining your health while building great memories and paying closer attention to what your body needs.